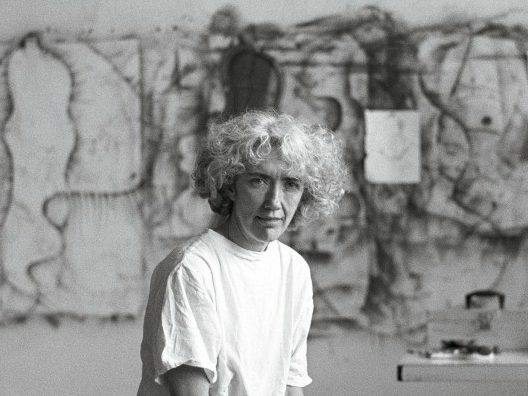 The Chicago Sun Times has announced that Elizabeth Murray (BFA 1962, HON 1992) will be the subject of American Masters, a one-hour documentary series on PBS. Murray, who passed in 2007 from lung cancer will be discussed by her Chicago art contemporaries alongside interviews with friends and family and art world personalities including Jerry Saltz (SAIC 1970–75, HON 2008). The director, Kristi Zea, approached Murray in 2004 about the film and the artist quickly agreed. In the documentary Zea will be “exploring the complexities of balancing a highly successful artistic career with being a wife and mother,” reports the Chicago Sun Times. The article goes on to describe Murray's work as, "distinguished by shaped, sometimes bulging canvases, bright colors, biomorphic forms and no shortage of humor, the artist’s work exhibits aspects of such styles as surrealism and post-minimalism. But she steadfastly transcended any one category." American Masters: Everybody Knows … Elizabeth Murray will air at 9:00 p.m. on Friday in Chicago on WTTW.